A recent flurry of Russian sanctions put in place by the United States are causing Russia's oligarch billionaires to repatriate more of their offshore assets, perversely aiding a long-held ambition for Vladimir Putin, who has been trying to encourage such repatriations for the past two decades according to a new Bloomberg report. While sanctions were first put into place during the Obama era as a result of the conflict in Ukraine, which however resulted in a muted financial response, as a result of the Trump administration‘s unpredictability and Trump's desire to demonstrate his anti-Kremlin stance to Mueller, Russian billionaires - increasingly at risk from a hostile financial regime - have been forced to move some of their assets back to state-run banks and out of an offshore system that has been a popular tax haven since communism has collapsed. And with new anti-Russia sanctions announced by the US and its allies at an increasingly rapid pace, the accelerating repatriations to Russia have been prompted by the desire to keep assets out of the reach of the United States Treasury, which with its implied near monopoly on the Swift financial transfer network, means that the only place "safe" is back in Russia, and under Putin's watchful eye. 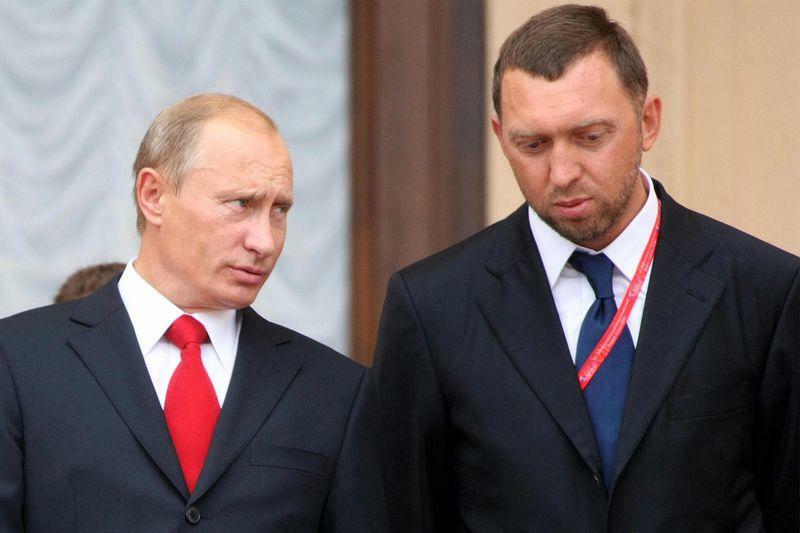 The reversal started back in April when oligarchs close to Putin such as Oleg Deripaska and Viktor Vekselberg, and their respective companies, wound up losing billions after being hit by penalties. With the threat of further sanctions looming, the pace at which money is being repatriated has accelerated: Russia now awaits possible new sanctions as a result of its involvement in the United States election and as a result of the potential nerve agent attack in England. Oleg Vyugin, a former senior central bank official who is now chairman of the Moscow Exchange, told Bloomberg: "It’s toxic to be Russian. And the richer you are, the more toxic you are." It's not just the billionaires: numerous Russian exporters have moved their assets out of United States and European banks, as well. While Russia's central bank doesn’t publish statistics on repatriated funds, and so getting an exact number is difficult, Russia’s largest lender, Sberbank PJSC, reported a 17% rise in corporate holdings and all currencies in January through August of this year, equating to about $90 billion. 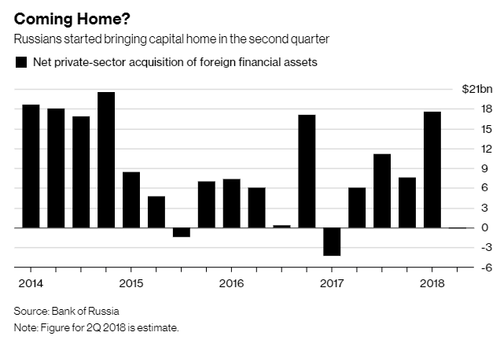 Additionally, balance of payment data indicates that the private sector in Russia brought more financial assets home then it sent overseas in the second quarter - only the second time this has happened since 2014. Here one can argue that raising sanctions on Russia, and the accelerated repatriation wave, is playing right into the Russian president's hands: in June, Vladimir Putin said that he wanted wealthy Russians to move their capital back to "where it’s earned", with the billions in offshore funds meant to reinforce the weakening Russian financial system. However, absent external interference, there simply weren't enough economic opportunities in Russia to prompt repatriation at the level that Putin seeks during his final term, which ends in 2024. Instead, net capital outflows are expected to be over $50 billion this year, which is double last year‘s total. 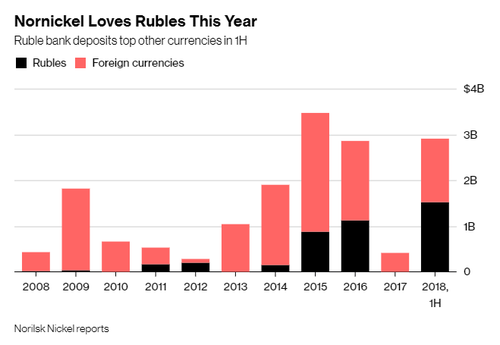 This total includes foreigners selling Ruble bonds, corporate foreign currency debt payments and Rubles that have been converted to dollars, as well as Euros held inside Russia. One sanctioned shareholder of a Kremlin-linked company told Bloomberg that he was told by his asset manager that he had a good year because he hadn't invested anything, resulting in him having nothing to lose. Other steps taken by Russia haven’t had encouraging results on their own, either. For instance, in March, the sale of a new Eurobond raised just $200 million - just 5% of its amount targeted - and there has been limited interest in two newly created "offshore" zones inside of Russia that the government set up to encourage repatriation in exchange for tax-free dividends. And since the Russian government has offered little help with the repatriation process companies have been left to fend for themselves. As Bloomberg notes, the penalties on Deripaska led to an aftershock across the country, prompting boardrooms in Russia to take action. The billionaire's aluminum supply giant, Rusal, was almost forced to halt production after international banks froze his accounts regardless of what currency they were in. Slava Smolyaninov, a strategist at BCS Global Markets in Moscow, told Bloomberg: "It showed how any international business can be brought to its knees in a second. That was a real eye-opener for many tycoons." While one can argue whether Trump's sanctions have led to a perverse benefit for Putin, there is another indirect consequences: accelerating de-dollarization. While the US dollar is still the dominant currency in global trade, Russian exporters are taking steps to minimize their use of the world's reserve currency which is becoming increasingly "weaponized" to pursue political goals. They hold the currency for commercial purposes, but they are also starting to stockpile rubles in case of an emergency. Another billionaire held commodity company, MMC Norilsk Nickel, had almost all of its cash deposits in foreign currencies just years ago. Now, it holds more than half in Rubles, equating to $1.5 billion. The company is also planning a record $1.8 billion interim dividend for the first half of this year. While it is unlikely that Russian companies will abandon the dollar altogether, major exporters are increasingly asking lenders to allow them to repay dollar loans in other currencies. The aftershock has also started to affect counterparties of Russian companies, who have been asked about their interest in settlement using alternative currencies. The result has been an emergence in local-currency funded bilateral trade: diamond company Alrosa has been selling gems to some Asian clients in rubles after also recently accepting Rupees from an Indian customer for the first time. According to Bloomberg, another major metals company has been selling its products for Euros while experimenting with the Chinese Yuan. In addition to money coming back to Russia, corporate registrations are also being repatriated. 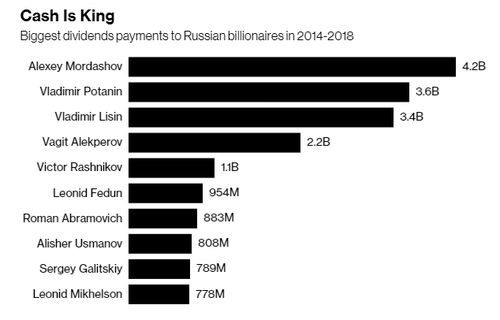 Billionaires like Alexey Mordashov and Alisher Usmanov are transferring stakes in enterprises they own to Russia registered companies. There is another clear winner from the crackdown on US offshore wealth: lawyers, as legal and consulting work related to adjusting for sanctions has flourished, growing to a $100 million per year industry in Russia right now, and the boom shows no signs of ebbing, according to Ilya Rybalkin, who started his own practice this month with a dozen other lawyers who left western firms to join him. "Demand for high-end legal services and lawyers who can navigate their clients through the hostile environment of sanctions is only going to grow." For now, the forced dedollarization is largely confined to Russia, where it is helping Putin amass much of Russia's wealth which fled the country in the past 20 years; however as the US pursues the use of a weaponized currency to hit back at more adversaries around the globe, it may serve two purposes: i) further weaken the role of the world's reserve currency and ii) provide indirect financial support for those very regimes that the US is seeking to challenge.